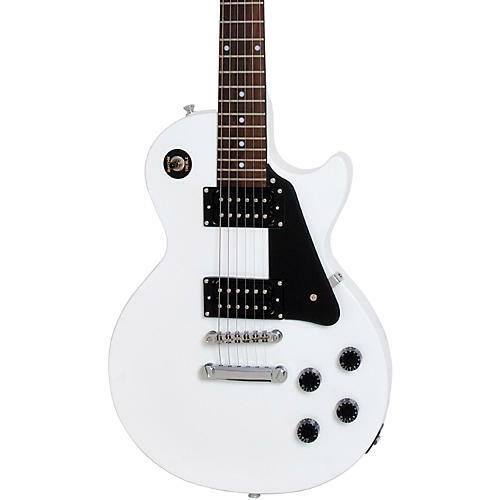 The original idea for the Epiphone Les Paul Studio Electric Guitar was to create a somewhat lower-priced Paul by dispensing with some cosmetics. The result was an especially clean, handsome guitar with all the Les Paul essentials. Newly designed in 2004, the Studio now has a thicker body that matches its namesake, hot open-coil humbuckers, a set mahogany neck, rosewood fingerboard, and mahogany body with carved top. Alpine White finish. The LockTone stopbar tailpiece and Tune-O-Matic bridge provide great sustain and tone, and make string changing easier. Limited lifetime warranty.